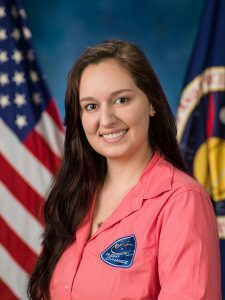 Stephanie Seuffert Breen, aerospace engineering ’12, works at NASA’s Johnson Space Center in Houston, TX. She’s a Flight Controller in Mission Control as part of the Visiting Vehicle Operations group. She met her husband at during her previous position at the NOAA Satellite Operations Facility in Washington DC, and now they both work at NASA JSC. She has successfully managed to develop a career in STEM while also being a wife and soon-to-be mother. Having grown up in Houston, TX, I have always been passionate about NASA and the space program. It has always been my dream to work at NASA, and about a year and a half ago I finally achieved that dream. While I was in college I was a very active member in my sorority, Gamma Phi Beta, and held many executive positions within the organization that taught me a lot about responsibility, loyalty, and friendship. I have also been a member of AIAA since my college years and have participated in several of their events including a competition while I was in college and a job fair not that long ago where I represented the company I currently work for. Honestly, when I was a kid there was a Sci-Fi TV show that I absolutely loved, called Stargate SG-1. Watching that show gave me a huge interest in space travel and sciences, especially through their very strong female character Samantha Carter. That character inspired me to choose a path in STEM and become an engineer. I think one of the greatest challenges women face in STEM fields is gaining respect from peers that are mostly men. I had an issue with this early on in my career, even before I had graduated from college, but now I think the environment I currently work in is very pro-women-in-STEM which is refreshing. The only thing we can do is continue to work hard and show that women do belong in STEM fields. I work hard and make sure my voice is heard. I have a strong personality which helps me convey my passions for STEM, and I am never afraid to ask questions or make sure my opinions are heard. Being strong and confident is very important. I would tell my younger self that nothing is impossible, and that I am smart and passionate enough to deserve the job that I truly want. Never let anyone ever tell you otherwise! Be strong and make sure you always strive towards your passion, no matter how hard it is or how impossible it seems. With enough hard work, nothing is impossible. I was surprised at how competitive it is. When taking up a degree or career in a STEM field, you will most likely be among some of the smartest people in the world and that can be intimidating sometimes. But it just makes you more proud of who you associate yourself with. Having more female professors! Having strong female role models is key.